No home gym is complete without the Body Champ PBC530 Power Rack System with Olympic Weight Plate Storage. With a dual purpose overhead bar for upper body workouts, and 2 built-in Olympic weight plate holders, this power rack system will enhance your fitness routine and your existing equipment. The U-shaped frame combined with joined single-piece construction improves stability while reinforced weld points prevent wobbling during use. Pair with a weight bench, weight sets, and other fitness accessories (sold separately) for a complete home workout. 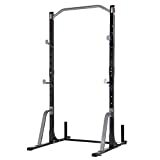 Additional Information:Accommodates 6 ft. and 7 ft. weight set bars Includes 2 pairs of easy-adjust tiered peg-hook catches 4 built-in floor anchors for optional enhanced stability 300 lbs. load capacity on bar catches 300 lbs. user weight capacity on upper workout bar Features 12 position settings for versatile training. 4 rubberized feet secure rack and prevent skids. Weight Capacity: 300 lbs.. Includes 1-year limited warranty. Dimensions: 42L x 62W x 82H in..
Dimensions: 42L x 62W x 82H in.